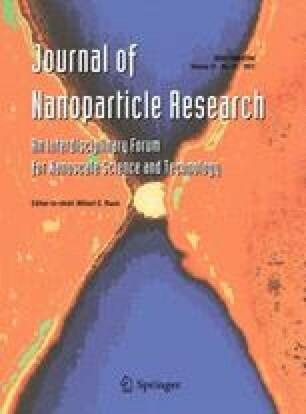 Direct space-selective growth of PbS nanoparticles, embedded inside a transparent porous sol–gel derived silica matrix, has been achieved using continuous laser irradiation. Before the irradiation, the porous silica host has been soaked in a PbS precursor solution. The effect of the concentration of PbS precursors and of the incident laser power on the mean particle size was studied. Absorption spectroscopy, X-ray diffraction analysis, and TEM measurements were used to identify the PbS crystallites inside the xerogel and to estimate the average particle size. It has been shown that PbS crystallite sizes range between 3 and 13 nm depending on the PbS precursors concentration. This study was supported by the French Agence Nationale de la Recherche (ANR) in the frame of the POMESCO project (Organized Photo-growth of Metallic and Semi-Conductor Nano-Objects Intended to Optic Devices), the “Conseil Régional Nord Pas de Calais Picardie” and the “Fonds Européen de Développement Economique des Régions”.